Antipsychotics, also known as neuroleptics or major tranquilizers, are a class of medication primarily used to manage psychosis (including delusions, hallucinations, paranoia or disordered thought), principally in schizophrenia and bipolar disorder. Antipsychotics are usually effective in relieving symptoms of psychosis in the short term. The long-term use of antipsychotics is associated with adverse effects such as involuntary movement disorders, gynecomastia, impotence, weight gain and metabolic syndrome. First-generation antipsychotics, known as typical antipsychotics, were discovered in the 1950s. Most second-generation drugs, known as atypical antipsychotics, have been developed more recently, although the first atypical antipsychotic, clozapine, was discovered in the 1960s and introduced clinically in the 1970s. Both generations of medication tend to block receptors in the brain's dopamine pathways, but atypicals tend to act on serotonin receptors as well. Neuroleptic, originating from Greek: νεῦρον (neuron) and λαμβάνω (take hold of) – thus meaning "which takes the nerve" – refers to both common neurological effects and side effects. Schizoaffective disorder most commonly in conjunction with either an antidepressant (in the case of the depressive subtype) or a mood stabiliser (in the case of the bipolar subtype). Bipolar disorder (acute mania and mixed episodes) may be treated with either typical or atypical antipsychotics, although atypical antipsychotics are usually preferred because they tend to have more favourable adverse effect profiles and, according to a recent meta-analysis, they tend to have a lower liability for causing conversion from mania to depression. Psychotic depression. In this indication it is a common practice for the psychiatrist to prescribe a combination of an atypical antipsychotic and an antidepressant as this practice is best supported by the evidence. Treatment-resistant (and not necessarily psychotic) major depression as an adjunct to standard antidepressant therapy. They are not recommended for dementia or insomnia unless other treatments have not worked. They are not recommended in children unless other treatments are not effective or unless the child has psychosis. The World Health Organization provides a description of recommendations for the prescription of antipsychotics for the purposes of the treatment of psychosis. Antipsychotic drug treatment is a key component of schizophrenia treatment algorithms recommended by the National Institute of Health and Care Excellence (NICE), the American Psychiatric Association, and the British Society for Psychopharmacology. The main effect of treatment with antipsychotics is to reduce the so-called "positive" symptoms, including delusions and hallucinations. There is mixed evidence to support a significant impact of antipsychotic use on negative symptoms (such as apathy, lack of emotional affect, and lack of interest in social interactions) or on the cognitive symptoms (disordered thinking, reduced ability to plan and execute tasks) of schizophrenia. In general, the efficacy of antipsychotic treatment in reducing both positive and negative symptoms appears to increase with increasing severity of baseline symptoms. Applications of antipsychotic drugs in the treatment of schizophrenia include prophylaxis in those showing symptoms that suggest that they are at high risk of developing psychosis, treatment of first episode psychosis, maintenance therapy, and treatment of recurrent episodes of acute psychosis. Test batteries such as the PACE (Personal Assessment and Crisis Evaluation Clinic) and COPS (Criteria of Prodromal Syndromes), which measure low level psychotic symptoms, and others focused on cognitive disturbances (Basic symptoms"), are used to evaluate people with early, low level symptoms of psychosis. Used in combination with family history information, these tests can identify a "high risk" group having a 20–40% risk of progression to frank psychosis within 2 years. These patients are often treated with low doses of antipsychotic drugs with the goal of reducing their symptoms and preventing progression to frank psychosis. While generally useful for reducing symptoms, the clinical trials performed to date provide little evidence that early use of antipsychotics, alone or in combination with cognitive-behavioral therapy, provides improved long term outcomes in those with prodromal symptoms. NICE recommends that all persons presenting with a first episode of frank psychosis be treated with both an antipsychotic drug and cognitive-behavioral therapy (CBT). NICE further recommends that those expressing a preference for CBT alone be informed that combination treatment is more efficacious. A diagnosis of schizophrenia is not normally made at this time, as up to 25% of those presenting with first episode psychosis are eventually found to suffer from bipolar disorder instead. The goals of treatment of these patients include reducing symptoms and potentially improving long-term treatment outcomes. Randomized clinical trials have provided evidence for the efficacy of antipsychotic drugs in achieving the former goal, with first-generation and second generation antipsychotics showing about equal efficacy. Evidence that early treatment has a favorable effect on long term outcomes is equivocal. Placebo-controlled trials of both first and second generation antipsychotic drugs consistently demonstrate the superiority of active drug to placebo in suppressing psychotic symptoms. A large meta-analysis of 38 trials of antipsychotic drugs in schizophrenia acute psychotic episodes showed an effect size of about 0.5. There is little or no difference in efficacy among approved antipsychotic drugs, including both first- and second-generation agents. The efficacy of such drugs is suboptimal. Few patients achieve complete resolution of symptoms. Response rates, calculated using various cutoff values for symptom reduction, are low and their interpretation is complicated by high placebo response rates and selective publication of clinical trial results. The majority of patients treated with an antipsychotic drug will experience a response within 4 weeks. The goals of continuing treatment are to maintain suppression of symptoms, prevent relapse, improve quality of life, and support engagement in psychosocial therapy. Maintenance therapy with antipsychotic drugs is clearly superior to placebo in preventing relapse, but is associated with weight gain, movement disorders, and high dropout rates. A 3-year trial following persons receiving maintenance therapy after an acute psychotic episode found that 33% obtained long-lasting symptom reduction, 13% achieved remission, and only 27% experienced satisfactory quality of life. The effect of relapse prevention on long term outcomes is uncertain, as historical studies show little difference in long term outcomes before and after the introduction of antipsychotic drugs. A significant challenge in the use of antipsychotic drugs for the prevention of relapse is the poor rate of compliance. In spite of the relatively high rates of adverse effects associated with these drugs, some evidence, including higher dropout rates in placebo arms compared to treatment arms in randomized clinical trials, suggest that most patients who discontinue treatment do so because of suboptimal efficacy. Antipsychotics are routinely used, often in conjunction with mood stabilisers such as lithium/valproate, as a first-line treatment for manic and mixed episodes associated with bipolar disorder. The reason for this combination is the therapeutic delay of the aforementioned mood stabilisers (for valproate therapeutic effects are usually seen around five days after treatment is commenced whereas lithium usually takes at least a week before the full therapeutic effects are seen) and the comparatively rapid antimanic effects of antipsychotic drugs. The antipsychotics have a documented efficacy when used alone in acute mania/mixed episodes. Three atypical antipsychotics (lurasidone, olanzapine and quetiapine) have also been found to possess efficacy in the treatment of bipolar depression as a monotherapy. Whereas only olanzapine and quetiapine have been proven to be effective broad-spectrum (i.e. against all three types of relapse— manic, mixed and depressive) prophylactic (or maintenance) treatments in patients with bipolar disorder. A recent Cochrane review also found that olanzapine had a less favourable risk/benefit ratio than lithium as a maintenance treatment for bipolar disorder. The American Psychiatric Association and the UK National Institute for Health and Care Excellence recommend antipsychotics for managing acute psychotic episodes in schizophrenia or bipolar disorder, and as a longer-term maintenance treatment for reducing the likelihood of further episodes. They state that response to any given antipsychotic can be variable so that trials may be necessary, and that lower doses are to be preferred where possible. A number of studies have looked at levels of "compliance" or "adherence" with antipsychotic regimes and found that discontinuation (stopping taking them) by patients is associated with higher rates of relapse, including hospitalization. An assessment for an underlying cause of behavior is needed before prescribing antipsychotic medication for symptoms of dementia. Antipsychotics in old age dementia showed a modest benefit compared to placebo in managing aggression or psychosis, but this is combined with a fairly large increase in serious adverse events. Thus, antipsychotics should not be used routinely to treat dementia with aggression or psychosis, but may be an option in a few cases where there is severe distress or risk of physical harm to others. Psychosocial interventions may reduce the need for antipsychotics. A number of atypical antipsychotics have some benefits when used in addition to other treatments in major depressive disorder. Aripiprazole, quetiapine, and olanzapine (when used in conjunction with fluoxetine) have received the Food and Drug Administration (FDA) labelling for this indication. There is, however, a greater risk of side effects with their use. Besides the above uses antipsychotics may be used for obsessive–compulsive disorder, posttraumatic stress disorder, personality disorders, Tourette syndrome, autism and agitation in those with dementia. Evidence however does not support the use of atypical antipsychotics in eating disorders or personality disorder. Risperidone may be useful for obsessive–compulsive disorder. The use of low doses of antipsychotics for insomnia, while common, is not recommended as there is little evidence of benefit and concerns regarding adverse effects. Low dose antipsychotics may also be used in treatment of impulse-behavioural and cognitive-perceptual symptoms of borderline personality disorder. In children they may be used in those with disruptive behavior disorders, mood disorders and pervasive developmental disorders or intellectual disability. Antipsychotics are only weakly recommended for Tourette syndrome, because although they are effective, side effects are common. The situation is similar for those on the autism spectrum. Much of the evidence for the off-label use of antipsychotics (for example, for dementia, OCD, PTSD, Personality Disorders, Tourette's) was of insufficient scientific quality to support such use, especially as there was strong evidence of increased risks of stroke, tremors, significant weight gain, sedation, and gastrointestinal problems. A UK review of unlicensed usage in children and adolescents reported a similar mixture of findings and concerns. A survey of children with pervasive developmental disorder found that 16.5% were taking an antipsychotic drug, most commonly for irritability, aggression, and agitation. Risperidone has been approved by the US FDA for the treatment of irritability in autistic children and adolescents. Aggressive challenging behavior in adults with intellectual disability is often treated with antipsychotic drugs despite lack of an evidence base. A recent randomized controlled trial, however, found no benefit over placebo and recommended that the use of antipsychotics in this way should no longer be regarded as an acceptable routine treatment. It is unclear whether the atypical (second-generation) antipsychotics offer advantages over older, first generation antipsychotics. Amisulpride, olanzapine, risperidone and clozapine may be more effective but are associated with greater side effects. Typical antipsychotics have equal drop-out and symptom relapse rates to atypicals when used at low to moderate dosages. Clozapine is an effective treatment for those who respond poorly to other drugs ("treatment-resistant" or "refractory" schizophrenia), but it has the potentially serious side effect of agranulocytosis (lowered white blood cell count) in less than 4% of people. Due to bias in the research the accuracy of comparisons of atypical antipsychotics is a concern. In 2005, a US government body, the National Institute of Mental Health published the results of a major independent study (the CATIE project). No other atypical studied (risperidone, quetiapine, and ziprasidone) did better than the typical perphenazine on the measures used, nor did they produce fewer adverse effects than the typical antipsychotic perphenazine, although more patients discontinued perphenazine owing to extrapyramidal effects compared to the atypical agents (8% vs. 2% to 4%). Compliance has not been shown to be different between the two types. Many researchers question the first-line prescribing of atypicals over typicals, and some even question the distinction between the two classes. In contrast, other researchers point to the significantly higher risk of tardive dyskinesia and other extrapyramidal symptoms with the typicals and for this reason alone recommend first-line treatment with the atypicals, notwithstanding a greater propensity for metabolic adverse effects in the latter. The UK government organization NICE recently revised its recommendation favoring atypicals, to advise that the choice should be an individual one based on the particular profiles of the individual drug and on the patient's preferences. The re-evaluation of the evidence has not necessarily slowed the bias toward prescribing the atypicals. For more detailed comparison of atypical antipsychotics, see Atypical antipsychotic § Adverse effects. Generally, more than one antipsychotic drug should not be used at a time because of increased adverse effects. Very rarely antipsychotics may cause tardive psychosis. - Akathisia — an often distressing sense of inner restlessness. - Galactorrhoea — unusual secretion of breast milk. Tardive dyskinesia appears to be more frequent with high-potency first-generation antipsychotics, such as haloperidol, and tends to appear after chronic and not acute treatment. It is characterized by slow (hence the tardive) repetitive, involuntary and purposeless movements, most often of the face, lips, legs, or torso, which tend to resist treatment and are frequently irreversible. The rate of appearance of TD is about 5% per year of use of antipsychotic drug (whatever the drug used). Blood dyscrasias (e.g., agranulocytosis, leukopaenia, and neutropaenia), which is more common in patients on clozapine. - Causing weight gain by antagonizing the histamine H1 and serotonin 5-HT2Creceptors and perhaps by interacting with other neurochemical pathways in the central nervous system. - Autonomic instability, which can manifest with tachycardia, nausea, vomiting, diaphoresis, etc. - Hyperthermia — elevated body temperature. QT interval prolongation — more prominent in those treated with amisulpride, pimozide, sertindole, thioridazine and ziprasidone. Seizures, particularly in people treated with chlorpromazine and clozapine. Some studies have found decreased life expectancy associated with the use of antipsychotics, and argued that more studies are needed. Antipsychotics may also increase the risk of early death in individuals with dementia. Antipsychotics typically worsen symptoms in people who suffer from depersonalisation disorder. Antipsychotic polypharmacy (prescribing two or more antipsychotics at the same time for an individual) is a common practice but not evidence-based or recommended, and there are initiatives to curtail it. Similarly, the use of excessively high doses (often the result of polypharmacy) continues despite clinical guidelines and evidence indicating that it is usually no more effective but is usually more harmful. Loss of grey matter and other brain structural changes over time are observed in schizophrenia. Meta-analyses of the effects of antipsychotic treatment on the course of grey matter loss and structural changes have reached conflicting conclusions. A 2012 meta-analysis concluded that grey matter loss is greater in patients treated with first generation antipsychotics relative to those treated with atypicals, and hypothesized a protective effect of atypicals as one possible explanation. A second meta-analysis suggested that treatment with antipsychotics was associated with increased grey matter loss. Subtle, long-lasting forms of akathisia are often overlooked or confused with post-psychotic depression, in particular when they lack the extra pyramidal aspect that psychiatrists have been taught to expect when looking for signs of akathisia. Withdrawal symptoms from antipsychotics may emerge during dosage reduction and discontinuation. Withdrawal symptoms can include nausea, emesis, anorexia, diarrhea, rhinorrhea, diaphoresis, myalgia, paresthesia, anxiety, dysphoria or depression, cognitive dysfunction, worsening of negative symptoms, agitation, restlessness, and insomnia. The psychological withdrawal symptoms can be mistaken for a relapse of the underlying disorder. Better management of the withdrawal syndrome may improve the ability of individuals to discontinue antipsychotics. Unexpected psychotic episodes have been observed in patients withdrawing from clozapine. This is referred to as supersensitivity psychosis, not to be equated with tardive psychosis. Tardive dyskinesia may abate during withdrawal from the antipsychotic agent, or it may persist. Withdrawal effects may also occur when switching a person from one antipsychotic to another, (it is presumed due to variations of potency and receptor activity). Such withdrawal effects can include cholinergic rebound, an activation syndrome, and motor syndromes including dyskinesias. These adverse effects are more likely during rapid changes between antipsychotic agents, so making a gradual change between antipsychotics minimises these withdrawal effects. The British National Formulary recommends a gradual withdrawal when discontinuing antipsychotic treatment to avoid acute withdrawal syndrome or rapid relapse. The process of cross-titration involves gradually increasing the dose of the new medication while gradually decreasing the dose of the old medication. Clinically used antipsychotic medications are listed below by drug group. Trade names appear in parentheses. A 2013 review has stated that the division of antipsychotics into first and second generation is perhaps not accurate. † indicates drugs that are no longer (or were never) marketed in English-speaking countries. ‡ denotes drugs that are no longer (or were never to begin with) marketed in the United States. Some antipsychotics are not firmly placed in either first-generation or second-generation classes. # denotes drugs that have been withdrawn worldwide. Acepromazine † — although it is mostly used in veterinary medicine. This category is for drugs that have been called both first and second-generation, depending on the literature being used. Amisulpride ‡ – Selective dopamine antagonist. Higher doses (greater than 400 mg) act upon post-synaptic dopamine receptors resulting in a reduction in the positive symptoms of schizophrenia, such as psychosis. Lower doses, however, act upon dopamine autoreceptors, resulting in increased dopamine transmission, improving the negative symptoms of schizophrenia. Lower doses of amisulpride have also been shown to have antidepressant and anxiolytic effects in non-schizophrenic patients, leading to its use in dysthymia and social phobias. Nemonapride † – Used in Japan. Remoxipride # – Has a risk of causing aplastic anaemia and, hence, has been withdrawn from the market worldwide. It has also been found to possess relatively low (virtually absent) potential to induce hyperprolactinaemia and extrapyramidal symptoms, likely attributable to its comparatively weak binding to (and, hence, rapid dissociation from) the D2 receptor. Sultopride – An atypical antipsychotic of the benzamide chemical class used in Europe, Japan, and Hong Kong for the treatment of schizophrenia. It was launched by Sanofi-Aventis in 1976. Sultopride acts as a selective D2 and D3 receptor antagonist. Iloperidone – Approved by the US FDA in 2009, it is fairly well tolerated, although hypotension, dizziness, and somnolence were very common side effects. Has not received regulatory approval in other countries, however. Lurasidone – Approved by the US FDA for schizophrenia and bipolar depression. Given once daily, it has shown mixed Phase III efficacy results but has a relatively well-tolerated side effect profile. It is also licensed for use as schizophrenia treatment in Canada. Not yet licensed elsewhere, however. Has procognitive effects via its antagonism of the 5-HT7 receptor. Paliperidone – Primary Metabolite of risperidone that was approved in 2006. Paliperidone palmitate – Long-acting version of paliperidone for once-monthly injection. Perospirone † – Has a higher incidence of extrapyramidal side effects than other atypical antipsychotics. Risperidone – Divided dosing is recommended until initial titration is completed, at which time the drug can be administered once daily. Used off-label to treat Tourette syndrome and anxiety disorder. Ziprasidone – Approved in 2004 to treat bipolar disorder. Side-effects include a prolonged QT interval in the heart, which can be dangerous for patients with heart disease or those taking other drugs that prolong the QT interval. Melperone † – Only used in a few European countries. No English-speaking country has licensed it to date. Aripiprazole – Partial agonist at the D2 receptor unlike almost all other clinically-utilized antipsychotics. Aripiprazole lauroxil – Long-acting version of aripiprazole for injection. Brexpiprazole – Partial agonist of the D2 receptor. Successor of aripiprazole. Cariprazine – A D3-preferring D2/D3 partial agonist. Asenapine – Used for the treatment of schizophrenia and acute mania associated with bipolar disorder. Clozapine – Requires complete blood counts every one to four weeks due to the risk of agranulocytosis. It has unparalleled efficacy in the treatment of treatment-resistant schizophrenia. Olanzapine – Used to treat psychotic disorders including schizophrenia, acute manic episodes, and maintenance of bipolar disorder. Used as an adjunct to antidepressant therapy, either alone or in combination with fluoxetine as Symbyax. Quetiapine – Used primarily to treat bipolar disorder and schizophrenia. Also used and licensed in a few countries (including Australia, the United Kingdom and the United States) as an adjunct to antidepressant therapy in patients with major depressive disorder. It's the only antipsychotic that's demonstrated efficacy as a monotherapy for the treatment of major depressive disorder. It indirectly serves as a norepinephrine reuptake inhibitor by means of its active metabolite, norquetiapine. Blonanserin – Approved by the PMDA in 2008. Used in Japan and South Korea. Pimavanserin – A selective 5-HT2A receptor antagonist approved for the treatment of Parkinson's disease psychosis in 2016. Sertindole ‡ – Developed by the Danish pharmaceutical company H. Lundbeck. Like the other atypical antipsychotics, it is believed to have antagonist activity at dopamine and serotonin receptors in the brain. Antipsychotic drugs such as haloperidol and chlorpromazine tend to block dopamine D2 receptors in the dopaminergic pathways of the brain. This means that dopamine released in these pathways has less effect. Excess release of dopamine in the mesolimbic pathway has been linked to psychotic experiences. Decreased dopamine release in the prefrontal cortex, and excess dopamine release in other pathways, are associated with psychotic episodes in schizophrenia and bipolar disorder. In addition to the antagonistic effects of dopamine, antipsychotics (in particular atypical neuroleptics) also antagonize 5-HT2A receptors. Different alleles of the 5-HT2A receptor have been associated with schizophrenia and other psychoses, including depression. Higher concentrations of 5-HT2A receptors in cortical and subcortical areas, in particular in the right caudate nucleus have been historically recorded. Typical antipsychotics are not particularly selective and also block dopamine receptors in the mesocortical pathway, tuberoinfundibular pathway, and the nigrostriatal pathway. Blocking D2 receptors in these other pathways is thought to produce some unwanted side effects that the typical antipsychotics can produce (see above). They were commonly classified on a spectrum of low potency to high potency, where potency referred to the ability of the drug to bind to dopamine receptors, and not to the effectiveness of the drug. High-potency antipsychotics such as haloperidol, in general, have doses of a few milligrams and cause less sleepiness and calming effects than low-potency antipsychotics such as chlorpromazine and thioridazine, which have dosages of several hundred milligrams. The latter have a greater degree of anticholinergic and antihistaminergic activity, which can counteract dopamine-related side-effects. Atypical antipsychotic drugs have a similar blocking effect on D2 receptors, however, most also act on serotonin receptors, especially 5-HT2A and 5-HT2C receptors. Both clozapine and quetiapine appear to bind just long enough to elicit antipsychotic effects but not long enough to induce extrapyramidal side effects and prolactin hypersecretion. 5-HT2A antagonism increases dopaminergic activity in the nigrostriatal pathway, leading to a lowered extrapyramidal side effect liability among the atypical antipsychotics. Amisulpride 0.43 (0.32-0.57) - - + + +/- +++ (0.66 [0.39-0.91]) +++/++ - Torsades de Pointes common on overdose. Has a comparatively low penetrability of the blood-brain barrier. Amoxapine ? ++ ++ +/- ++/+ ++/+ ++/+ ++/+ ++/+ Amoxapine is also an antidepressant. Very toxic in overdose due to the potential for renal failure and seizures. Aripiprazole 0.61 (0.51-0.72) - + +/- (Akathisia mostly) + +/- - (0.01 [–0.13-0·15]) - (can reduce prolactin levels) - Only clinically-utilised antipsychotic that does not act by antagonising the D2 receptor and rather partially agonises this receptor. Asenapine 0.69 (0.54-0.86) - ++ + + +/- ++/+ (0.30 [–0.04-0.65]) + + Oral hypoesthesia. Has a complex pharmacologic profile. Blonanserin ~0.7 + + ++/+ +/- +/- - ++/+ +/- Only used in a few East Asian countries. Chlorpromazine 0.65 (0.5-0.84) +++ +++ ++ ++ ++ ++ +++ +++ First marketed antipsychotic, sort of the prototypical low-potency first-generation (typical) antipsychotic. Clozapine 0.46 (0.32-0.65) +++ +++ - +++ +++ + - +++ Notable AEs: Agranulocytosis, neutropaenia, leukopaenia and myocarditis. Dose-dependent seizure risk. Overall the most effective antipsychotic, on average. Usually reserved for treatment-resistant cases or highly suicidal patients. Droperidol ? +/- +/- +++ +/- +/- ? +++ ? Mostly used for postoperative nausea and vomiting. Flupenthixol ? ++ + ++ ++ ++ + +++ + Also used in lower doses for depression. Fluphenazine 0.69 (0.24-1.97) ++ + +++ + + + +++ + High-potency first-generation (typical) antipsychotic. Haloperidol 0.8 (0.71-0.90) + + +++ + +/- + (0.11 [0.03-0.19]) +++ + Prototypical high-potency first-generation (typical) antipsychotic. Iloperidone 0.69 (0.56-0.84) - +/- + ++ ++ ++ (0.34 [0.22-0.46]) ++/+ + ? Levomepromazine ? +++ +++ ++/+ ++ ++ ? +++ +++ Also used as an analgesic, agitation, anxiety and emesis. Loxapine 0.52 (0.28-0.98) + ++ +++ + +/- ? +++ ++ ? Lurasidone 0.77 (0.61-0.96) - - ++/+ - - - (–0.10 [–0.21-0.01]) ++/+ - May be particularly helpful in ameloriating the cognitive symptoms of schizophrenia, likely due to its 5-HT7 receptor. Melperone ? - +/- - +/- +/- ++ - ++/+ Several smaller low-quality clinical studies have reported its efficacy in the treatment of treatment-resistant schizophrenia. Only approved for use in a few European countries. It is known that off-licence prescribing of melperone is occurring in the United Kingdom. Is a butyrophenone, low-potency atypical antipsychotic that has been tried as a treatment for Parkinson's disease psychosis, although with negative results. Molindone ? - ++/+ + - - ? +++ +/- Withdrawn from the market. Seems to promote weight loss (which is rather unusual for an antipsychotic seeing how they tend to promote weight gain). Olanzapine 0.46 (0.41-0.52) + ++ + +++ +++ + (0.22 [0.11-0.31]) + + ? Paliperidone 0.48 (0.39-0.58) - - ++/+ (dose-dependent) ++ + - (0.05 [–0.18-0.26]) +++ ++ Active metabolite of risperidone. Perazine 0.62 (0.4-1.10) ? ? ? ? ? ? ? ? Limited data available on adverse effects. Periciazine ? +++ +++ + ++ + ? +++ ++ Also used to treat severe anxiety. Not licensed for use in the US. Perospirone ? +/- + ++/+ +/- ? - ++/+ - Usually grouped with the atypical antipsychotics despite its relatively high propensity for causing extrapyramidal side effects. Perphenazine 0.30 (0.04, 2.33) + + +++ + + + +++ + Has additional antiemetic effects. Pimozide 1.01 (0.30 to 3.39) + + + + + +++ +++ + High potency first-generation (typical) antipsychotic. Pipotiazine ? ++ ++ ++ ++ + ? +++ ++ Only available in the UK. Prochlorperazine ? ? ? +++ ? ? + +++ ? Primarily used in medicine as an antiemetic. Quetiapine 0.61 (0.52-0.71) ++/+ ++ - ++ ++/+ + (0.17 [0.06-0.29]) - ++ Binds to the D2 receptor in a hit and run fashion. That is it rapidly dissociates from said receptor and hence produces antipsychotic effects but does not bind to the receptor long enough to produce extrapyramidal side effects and hyperprolactinaemia. Remoxipride ? - +/- - +/- +/- - - - Removed from the market amidst concerns about an alarmingly high rate of aplastic anaemia. Risperidone 0.53 (0.46-0.60) - ++/+ (dose-dependent) ++ ++ ++/+ ++ (0.25 [0.15-0.36]) +++ ++ ? Sertindole 0.78 (0.61-0.98) - - - ++ ++/+ +++ (0.90 [0.76-1.02]) - +++ Not licensed for use in the US. Sulpiride 1.00 (0.25-4.00) - - + + +/- + +++/++ - Not licensed for use in the US. Thioridazine 0.67 (0.32-1.40) +++ +++ + ++ ++ +++ +++ +++ Dose-dependent risk for degenerative retinopathies. Found utility in reducing the resistance of multidrug and even extensively resistant strains of tuberculosis to antibiotics. Tiotixene ? - + +++ ++ ++/+ + +++ + ? Trifluoperazine 0.94 (0.59-1.48) +/- + +++ + +/- ? +++ + ? Ziprasidone 0.72 (0.59 to 0.86) - ++ + - - ++ (0.41 [0.31 to 0.51]) ++/+ + ? Zotepine 0.69 (0.41 to 1.07) + +++ ++ +++/++ +++/++ ++ +++ ++ Dose-dependent risk of seizures. Not licensed for use in the US. Zuclopenthixol ? ++ ++ +++ ++ ++ ? +++ + Not licensed for use in the US. Note: "Notable" is to mean side-effects that are particularly unique to the antipsychotic drug in question. For example, clozapine is notorious for its ability to cause agranulocytosis. If data on the propensity of a particular drug to cause a particular AE is unavailable an estimation is substituted based on the pharmacologic profile of the drug. Asenapine ++/+ ++ ? ++ ? Chlorpromazine ++ ? ? ? ? Clozapine +++ ? ? ? ? Haloperidol ++ +++ ? ? ? Iloperidone + ? ? ? ? Loxapine +++/++ +++ (only in the treatment of agitation) ? ? ? Lurasidone + ? +++ ? ? Melperone +++ ? ? ? ? Paliperidone ++ +++/++ ? ? ? Perospirone + ? ? ? ? Sertindole ++ ? ? ? ? Ziprasidone ++/+ + ? + ? Zotepine ++ ? ? ? ? Iloperidone 96% ? 95% 2-4 h ? 1340-2800 L Urine (45-58%), faeces (20-22%) Oral CYP3A4, CYP2D6 None notable. Periciazine ? 12 h ? 2 h 150 ng/mL ? Urine Oral ? ? The original antipsychotic drugs were happened upon largely by chance and then tested for their effectiveness. The first, chlorpromazine, was developed as a surgical anesthetic. It was first used on psychiatric patients because of its powerful calming effect; at the time it was regarded as a non-permanent "pharmacological lobotomy". Lobotomy at the time was used to treat many behavioral disorders, including psychosis, although its effect was to markedly reduce behavior and mental functioning of all types. However, chlorpromazine proved to reduce the effects of psychosis in a more effective and specific manner than lobotomy, even though it was known to be capable of causing severe sedation. The underlying neurochemistry involved has since been studied in detail, and subsequent antipsychotic drugs have been discovered by an approach that incorporates this sort of information. The discovery of chlorpromazine's psychoactive effects in 1952 led to further research that resulted in the development of antidepressants, anxiolytics, and the majority of other drugs now used in the management of psychiatric conditions. In 1952, Henri Laborit described chlorpromazine only as inducing indifference towards what was happening around them in nonpsychotic, nonmanic patients, and Jean Delay and Pierre Deniker described it as controlling manic or psychotic agitation. The former claimed to have discovered a treatment for agitation in anyone, and the latter team claimed to have discovered a treatment for psychotic illness. Until the 1970s there was considerable debate within psychiatry on the most appropriate term to use to describe the new drugs. In the late 1950s the most widely used term was "neuroleptic", followed by "major tranquilizer" and then "ataraxic". The first recorded use of the term tranquilizer dates from the early nineteenth century. In 1953 Frederik F. Yonkman, a chemist at the Swiss-based Cibapharmaceutical company, first used the term tranquilizer to differentiate reserpine from the older sedatives. The word neuroleptic was coined in 1955 by Delay and Deniker after their discovery (1952) of the antipsychotic effects of chlorpromazine. It is derived from the Greek: "νεῦρον" (neuron, originally meaning "sinew" but today referring to the nerves) and "λαμβάνω" (lambanō, meaning "take hold of"). Thus, the word means taking hold of one's nerves. It was often taken to refer also to common side effects such as reduced activity in general, as well as lethargy and impaired motor control. Although these effects are unpleasant and in some cases harmful, they were at one time, along with akathisia, considered a reliable sign that the drug was working. The term "ataraxy" was coined by the neurologist Howard Fabing and the classicist Alister Cameron to describe the observed effect of psychic indifference and detachment in patients treated with chlorpromazine. This term derived from the Greek adjective "ἀτάρακτος" (ataraktos), which means "not disturbed, not excited, without confusion, steady, calm". In the use of the terms "tranquilizer" and "ataractic", medical practitioners distinguished between the "major tranquilizers" or "major ataractics", which referred to drugs used to treat psychoses, and the "minor tranquilizers" or "minor ataractics", which referred to drugs used to treat neuroses. While popular during the 1950s, these terms are infrequently used today. They are being abandoned in favor of "antipsychotic", which refers to the drug's desired effects. Today, "minor tranquilizer" can refer to anxiolytic and/or hypnotic drugs such as the benzodiazepines and nonbenzodiazepines, which have some antipsychotic properties and are recommended for concurrent use with antipsychotics, and are useful for insomnia or drug-induced psychosis. They are powerful (and potentially addictive) sedatives. Antipsychotics are broadly divided into two groups, the typical or first-generation antipsychotics and the atypical or second-generation antipsychotics. The typical antipsychotics are classified according to their chemical structure while the atypical antipsychotics are classified according to their pharmacological properties. These include serotonin-dopamine antagonists (see dopamine antagonist and serotonin antagonist), multi-acting receptor-targeted antipsychotics (MARTA, those targeting several systems), and dopamine partial agonists, which are often categorized as atypicals. The term major tranquilizer was used for older antipsychotic drugs. The term neuroleptic is often used as a synonym for antipsychotic, even though - strictly speaking - the two terms are not interchangeable. Antipsychotic drugs are a subgroup of neuroleptic drugs, because the latter have a wider range of effects. Antipsychotics were once among the biggest selling and most profitable of all drugs, generating $22 billion in global sales in 2008. By 2003 in the US, an estimated 3.21 million patients received antipsychotics, worth an estimated $2.82 billion. Over 2/3 of prescriptions were for the newer, more expensive atypicals, each costing on average $164 per year, compared to $40 for the older types. By 2008, sales in the US reached $14.6 billion, the biggest selling drugs in the US by therapeutic class. Antipsychotics are sometimes administered as part of compulsory psychiatric treatment via inpatient (hospital) commitment or outpatient commitment. They may be administered orally or, in some cases, through long-acting (depot) injections administered in the dorsgluteal, ventrogluteal or deltoid muscle. Use of this class of drugs has a history of criticism in residential care. As the drugs used can make patients calmer and more compliant, critics claim that the drugs can be overused. Outside doctors can feel under pressure from care home staff. In an official review commissioned by UK government ministers it was reported that the needless use of antipsychotic medication in dementia care was widespread and was linked to 1800 deaths per year. In the US, the government has initiated legal action against the pharmaceutical company Johnson & Johnson for allegedly paying kickbacks to Omnicare to promote its antipsychotic risperidone (Risperdal) in nursing homes. There has also been controversy about the role of pharmaceutical companies in marketing and promoting antipsychotics, including allegations of downplaying or covering up adverse effects, expanding the number of conditions or illegally promoting off-label usage; influencing drug trials (or their publication) to try to show that the expensive and profitable newer atypicals were superior to the older cheaper typicals that were out of patent. Following charges of illegal marketing, settlements by two large pharmaceutical companies in the US set records for the largest criminal fines ever imposed on corporations. One case involved Eli Lilly and Company's antipsychotic Zyprexa, and the other involved Bextra. In the Bextra case, the government also charged Pfizer with illegally marketing another antipsychotic, Geodon. In addition, Astrazeneca faces numerous personal-injury lawsuits from former users of Seroquel (quetiapine), amidst federal investigations of its marketing practices. By expanding the conditions for which they were indicated, Astrazeneca's Seroquel and Eli Lilly's Zyprexa had become the biggest selling antipsychotics in 2008 with global sales of $5.5 billion and $5.4 billion respectively. Harvard medical professor Joseph Biederman conducted research on bipolar disorder in children that led to an increase in such diagnoses. A 2008 Senate investigation found that Biederman also received $1.6 million in speaking and consulting fees between 2000 and 2007 — some of them undisclosed to Harvard — from companies including makers of antipsychotic drugs prescribed for children with bipolar disorder. Johnson & Johnson gave more than $700,000 to a research center that was headed by Biederman from 2002 to 2005, where research was conducted, in part, on Risperdal, the company's antipsychotic drug. Biederman has responded saying that the money did not influence him and that he did not promote a specific diagnosis or treatment. Pharmaceutical companies have also been accused of attempting to set the mental health agenda through activities such as funding consumer advocacy groups. It is recommended that persons with dementia who exhibit behavioral and psychological symptoms should not be given antipsychotics before trying other treatments. When taking antipsychotics this population has increased risk of cerebrovascular effects, parkinsonism or extrapyramidal symptoms, sedation, confusion and other cognitive adverse effects, weight gain, and increased mortality. Physicians and caretakers of persons with dementia should try to address symptoms including agitation, aggression, apathy, anxiety, depression, irritability, and psychosis with alternative treatments whenever antipsychotic use can be replaced or reduced. Elderly persons often have their dementia treated first with antipsychotics and this is not the best management strategy. ^ Hippius, H. (1989-03-01). "The history of clozapine". Psychopharmacology. 99 (1): S3–S5. doi:10.1007/BF00442551. ISSN 0033-3158. ^ King C, Voruganti LN (May 2002). "What's in a name? The evolution of the nomenclature of antipsychotic drugs". Journal of Psychiatry & Neuroscience. 27 (3): 168–75. PMC 161646. PMID 12066446. ^ a b c d e Leucht S, Corves C, Arbter D, Engel RR, Li C, Davis JM (January 2009). "Second-generation versus first-generation antipsychotic drugs for schizophrenia: a meta-analysis". Lancet. 373 (9657): 31–41. doi:10.1016/S0140-6736(08)61764-X. PMID 19058842. ^ Goikolea JM, Colom F, Torres I, Capapey J, Valentí M, Undurraga J, Grande I, Sanchez-Moreno J, Vieta E (January 2013). "Lower rate of depressive switch following antimanic treatment with second-generation antipsychotics versus haloperidol". Journal of Affective Disorders. 144 (3): 191–8. doi:10.1016/j.jad.2012.07.038. PMID 23089129. ^ a b c d e f Taylor D, Paton C, Kapur S, Taylor D (2012). The Maudsley prescribing guidelines in psychiatry (11th ed.). Chichester, West Sussex, UK: Wiley-Blackwell. ISBN 978-0-470-97948-8. ^ a b "American Psychiatric Association Five Things Physicians and Patients Should Question". Choosing Wisely. Archived from the original on 3 December 2013. Retrieved 23 September 2013. ^ a b c d "Psychosis and schizophrenia in adults (CG178)". Archived from the original on 4 March 2014. ^ a b c d e f g Barnes TR (May 2011). "Evidence-based guidelines for the pharmacological treatment of schizophrenia: recommendations from the British Association for Psychopharmacology". Journal of Psychopharmacology. 25 (5): 567–620. doi:10.1177/0269881110391123. PMID 21292923. ^ Miyamoto S, Miyake N, Jarskog LF, Fleischhacker WW, Lieberman JA (December 2012). "Pharmacological treatment of schizophrenia: a critical review of the pharmacology and clinical effects of current and future therapeutic agents". Molecular Psychiatry. 17 (12): 1206–27. doi:10.1038/mp.2012.47. PMID 22584864. ^ a b Hartling L, Abou-Setta AM, Dursun S, Mousavi SS, Pasichnyk D, Newton AS (October 2012). "Antipsychotics in adults with schizophrenia: comparative effectiveness of first-generation versus second-generation medications: a systematic review and meta-analysis". Annals of Internal Medicine. 157 (7): 498–511. doi:10.7326/0003-4819-157-7-201210020-00525. PMID 22893011. ^ Furukawa TA, Levine SZ, Tanaka S, Goldberg Y, Samara M, Davis JM, Cipriani A, Leucht S (January 2015). "Initial severity of schizophrenia and efficacy of antipsychotics: participant-level meta-analysis of 6 placebo-controlled studies". JAMA Psychiatry. 72 (1): 14–21. doi:10.1001/jamapsychiatry.2014.2127. PMID 25372935. ^ "NICE Treatment Guidance 2014". Archived from the original on 13 August 2014. Retrieved 7 August 2014. ^ Leucht S, Arbter D, Engel RR, Kissling W, Davis JM (April 2009). "How effective are second-generation antipsychotic drugs? A meta-analysis of placebo-controlled trials". Molecular Psychiatry. 14 (4): 429–47. doi:10.1038/sj.mp.4002136. PMID 18180760. ^ a b c d e f g h i j Leucht S, Cipriani A, Spineli L, Mavridis D, Orey D, Richter F, Samara M, Barbui C, Engel RR, Geddes JR, Kissling W, Stapf MP, Lässig B, Salanti G, Davis JM (September 2013). "Comparative efficacy and tolerability of 15 antipsychotic drugs in schizophrenia: a multiple-treatments meta-analysis". Lancet. 382 (9896): 951–62. doi:10.1016/S0140-6736(13)60733-3. PMID 23810019. ^ Beitinger R, Lin J, Kissling W, Leucht S (October 2008). "Comparative remission rates of schizophrenic patients using various remission criteria". Progress in Neuro-Psychopharmacology & Biological Psychiatry. 32 (7): 1643–51. doi:10.1016/j.pnpbp.2008.06.008. PMID 18616969. ^ a b Leucht S, Tardy M, Komossa K, Heres S, Kissling W, Davis JM (May 2012). "Maintenance treatment with antipsychotic drugs for schizophrenia". The Cochrane Database of Systematic Reviews. 5 (5): CD008016. doi:10.1002/14651858.CD008016.pub2. PMID 22592725. ^ Kinon BJ, Ascher-Svanum H, Adams DH, Chen L (October 2008). "The temporal relationship between symptom change and treatment discontinuation in a pooled analysis of 4 schizophrenia trials". Journal of Clinical Psychopharmacology. 28 (5): 544–9. doi:10.1097/JCP.0b013e318185e74a. PMID 18794651. ^ a b Young LL, Kradjan WA, Guglielmo BJ, Corelli RL, Williams BR, Koda-Kimble MA (2009). Applied therapeutics: the clinical use of drugs (9th ed.). Philadelphia: Wolters Kluwer Health/Lippincott Williams & Wilkins. p. 3040. ISBN 978-0-7817-6555-8. ^ Correll CU, Sheridan EM, DelBello MP (March 2010). "Antipsychotic and mood stabilizer efficacy and tolerability in pediatric and adult patients with bipolar I mania: a comparative analysis of acute, randomized, placebo-controlled trials". Bipolar Disorders. 12 (2): 116–41. doi:10.1111/j.1399-5618.2010.00798.x. PMID 20402706. ^ Lowes R. "Lurasidone Approved for Bipolar Depression". Medscape. Archived from the original on 2 October 2013. Retrieved 2 October 2013. ^ Tohen M, Katagiri H, Fujikoshi S, Kanba S (July 2013). "Efficacy of olanzapine monotherapy in acute bipolar depression: a pooled analysis of controlled studies". Journal of Affective Disorders. 149 (1–3): 196–201. doi:10.1016/j.jad.2013.01.022. PMID 23485111. ^ Thase ME (February 2008). "Quetiapine monotherapy for bipolar depression". Neuropsychiatric Disease and Treatment. 4 (1): 11–21. doi:10.2147/ndt.s1162. PMC 2515925. PMID 18728771. ^ Tohen M, Greil W, Calabrese JR, Sachs GS, Yatham LN, Oerlinghausen BM, Koukopoulos A, Cassano GB, Grunze H, Licht RW, Dell'Osso L, Evans AR, Risser R, Baker RW, Crane H, Dossenbach MR, Bowden CL (July 2005). "Olanzapine versus lithium in the maintenance treatment of bipolar disorder: a 12-month, randomized, double-blind, controlled clinical trial". The American Journal of Psychiatry. 162 (7): 1281–90. doi:10.1176/appi.ajp.162.7.1281. PMID 15994710. ^ Duffy A, Milin R, Grof P (February 2009). "Maintenance treatment of adolescent bipolar disorder: open study of the effectiveness and tolerability of quetiapine". BMC Psychiatry. 9: 4. doi:10.1186/1471-244X-9-4. PMC 2644292. PMID 19200370. ^ Weisler RH, Nolen WA, Neijber A, Hellqvist A, Paulsson B (November 2011). "Continuation of quetiapine versus switching to placebo or lithium for maintenance treatment of bipolar I disorder (Trial 144: a randomized controlled study)". The Journal of Clinical Psychiatry. 72 (11): 1452–64. doi:10.4088/JCP.11m06878. PMID 22054050. ^ Cipriani A, Rendell JM, Geddes J (January 2009). Cipriani A, ed. "Olanzapine in long-term treatment for bipolar disorder". The Cochrane Database of Systematic Reviews (1): CD004367. doi:10.1002/14651858.CD004367.pub2. PMID 19160237. ^ Lehman AF, Lieberman JA, Dixon LB, McGlashan TH, Miller AL, Perkins DO, Kreyenbuhl J (February 2004). "Practice guideline for the treatment of patients with schizophrenia, second edition". The American Journal of Psychiatry. 161 (2 Suppl): 1–56. PMID 15000267. ^ AMDA – The Society for Post-Acute and Long-Term Care Medicine (February 2014), "Ten Things Physicians and Patients Should Question", Choosing Wisely: an initiative of the ABIM Foundation, AMDA – The Society for Post-Acute and Long-Term Care Medicine, archived from the original on 13 September 2014, retrieved 20 April 2015 . ^ Ballard C, Waite J (January 2006). Ballard CG, ed. "The effectiveness of atypical antipsychotics for the treatment of aggression and psychosis in Alzheimer's disease". The Cochrane Database of Systematic Reviews (1): CD003476. doi:10.1002/14651858.CD003476.pub2. PMID 16437455. ^ Richter T, Meyer G, Möhler R, Köpke S (December 2012). Köpke S, ed. "Psychosocial interventions for reducing antipsychotic medication in care home residents". The Cochrane Database of Systematic Reviews. 12: CD008634. doi:10.1002/14651858.CD008634.pub2. PMID 23235663. ^ a b Komossa K, Depping AM, Gaudchau A, Kissling W, Leucht S (December 2010). "Second-generation antipsychotics for major depressive disorder and dysthymia". The Cochrane Database of Systematic Reviews (12): CD008121. doi:10.1002/14651858.CD008121.pub2. PMID 21154393. ^ Spielmans GI, Berman MI, Linardatos E, Rosenlicht NZ, Perry A, Tsai AC (2013). "Adjunctive atypical antipsychotic treatment for major depressive disorder: a meta-analysis of depression, quality of life, and safety outcomes". PLoS Medicine. 10 (3): e1001403. doi:10.1371/journal.pmed.1001403. PMC 3595214. PMID 23554581. ^ Truven Health Analytics, Inc. DrugPoint System (Internet) [cited 2013 Oct 2]. Greenwood Village, CO: Thomsen Healthcare; 2013. ^ a b Maglione M, Maher AR, Hu J, Wang Z, Shanman R, Shekelle PG, Roth B, Hilton L, Suttorp MJ (2011). Off-Label Use of Atypical Antipsychotics: An Update. Comparative Effectiveness Reviews, No. 43. Rockville: Agency for Healthcare Research and Quality. PMID 22973576. ^ American Psychiatric Association and American Psychiatric Association. Work Group on Borderline Personality Disorder (2001). Practice Guideline for the Treatment of Patients With Borderline Personality Disorder. American Psychiatric Pub. p. 4. ISBN 978-0890423196. Retrieved June 5, 2013. ^ Zuddas A, Zanni R, Usala T (August 2011). "Second generation antipsychotics (SGAs) for non-psychotic disorders in children and adolescents: a review of the randomized controlled studies". European Neuropsychopharmacology. 21 (8): 600–20. doi:10.1016/j.euroneuro.2011.04.001. PMID 21550212. ^ Pringsheim T, Doja A, Gorman D, McKinlay D, Day L, Billinghurst L, Carroll A, Dion Y, Luscombe S, Steeves T, Sandor P (March 2012). "Canadian guidelines for the evidence-based treatment of tic disorders: pharmacotherapy". Canadian Journal of Psychiatry. 57 (3): 133–43. doi:10.1177/070674371205700302. PMID 22397999. ^ "Evidence Lacking to Support Many Off-label Uses of Atypical Antipsychotics" (Press release). Agency for Healthcare Research and Quality. 17 January 2007. Archived from the original on 25 February 2013. Retrieved 29 July 2013. ^ James AC (2010). "Prescribing antipsychotics for children and adolescents". Advances in Psychiatric Treatment. 16 (1): 63–75. doi:10.1192/apt.bp.108.005652. ^ Posey DJ, Stigler KA, Erickson CA, McDougle CJ (January 2008). "Antipsychotics in the treatment of autism". The Journal of Clinical Investigation. 118 (1): 6–14. doi:10.1172/JCI32483. PMC 2171144. PMID 18172517. ^ Romeo R, Knapp M, Tyrer P, Crawford M, Oliver-Africano P (July 2009). "The treatment of challenging behaviour in intellectual disabilities: cost-effectiveness analysis". Journal of Intellectual Disability Research. 53 (7): 633–43. doi:10.1111/j.1365-2788.2009.01180.x. PMID 19460067. ^ Barry SJ, Gaughan TM, Hunter R (June 2012). "Schizophrenia". BMJ Clinical Evidence. 2012. PMC 3385413. PMID 23870705. Archived from the original on 2014-09-11. ^ Heres S, Davis J, Maino K, Jetzinger E, Kissling W, Leucht S (February 2006). "Why olanzapine beats risperidone, risperidone beats quetiapine, and quetiapine beats olanzapine: an exploratory analysis of head-to-head comparison studies of second-generation antipsychotics". The American Journal of Psychiatry. 163 (2): 185–94. doi:10.1176/appi.ajp.163.2.185. PMID 16449469. ^ Lieberman JA, Stroup TS, McEvoy JP, Swartz MS, Rosenheck RA, Perkins DO, Keefe RS, Davis SM, Davis CE, Lebowitz BD, Severe J, Hsiao JK (September 2005). "Effectiveness of antipsychotic drugs in patients with chronic schizophrenia". The New England Journal of Medicine. 353 (12): 1209–23. doi:10.1056/NEJMoa051688. PMID 16172203. ^ Voruganti LP, Baker LK, Awad AG (March 2008). "New generation antipsychotic drugs and compliance behaviour". Current Opinion in Psychiatry. 21 (2): 133–9. doi:10.1097/YCO.0b013e3282f52851. PMID 18332660. ^ Paczynski RP, Alexander GC, Chinchilli VM, Kruszewski SP (January 2012). "Quality of evidence in drug compendia supporting off-label use of typical and atypical antipsychotic medications". The International Journal of Risk & Safety in Medicine. 24 (3): 137–46. doi:10.3233/JRS-2012-0567. PMID 22936056. ^ Owens, D. C. (2008). "How CATIE brought us back to Kansas: a critical re-evaluation of the concept of atypical antipsychotics and their place in the treatment of schizophrenia". Advances in Psychiatric Treatment. 14 (1): 17–28. doi:10.1192/apt.bp.107.003970. ^ Fischer-Barnicol D, Lanquillon S, Haen E, Zofel P, Koch HJ, Dose M, Klein HE (2008). "Typical and atypical antipsychotics--the misleading dichotomy. Results from the Working Group 'Drugs in Psychiatry' (AGATE)". Neuropsychobiology. 57 (1–2): 80–7. doi:10.1159/000135641. PMID 18515977. ^ Casey DE (March 1999). "Tardive dyskinesia and atypical antipsychotic drugs". Schizophrenia Research. 35 Suppl (Suppl 1): S61–6. doi:10.1016/S0920-9964(98)00160-1. PMID 10190226. ^ Makhinson M (January 2010). "Biases in medication prescribing: the case of second-generation antipsychotics". Journal of Psychiatric Practice. 16 (1): 15–21. doi:10.1097/01.pra.0000367774.11260.e4. PMID 20098227. Association, American Psychiatric (2006). Practice Guideline for the Treatment of Patients With Schizophrenia Second Edition. 1. doi:10.1176/appi.books.9780890423363.45859. ISBN 978-0-89042-336-3. Stahl SM, Grady MM (February 2004). "A critical review of atypical antipsychotic utilization: comparing monotherapy with polypharmacy and augmentation". Current Medicinal Chemistry. 11 (3): 313–27. doi:10.2174/0929867043456070. PMID 14965234. ^ Moore DP, Puri BK (2012). Textbook of Clinical Neuropsychiatry and Behavioral Neuroscience, Third Edition. CRC Press. p. 791. ISBN 9781444164947. Archived from the original on 25 November 2017. ^ Muench J, Hamer AM (March 2010). "Adverse effects of antipsychotic medications". American Family Physician. 81 (5): 617–22. PMID 20187598. ^ Lieberman JA (2004). "Managing anticholinergic side effects". Primary Care Companion to the Journal of Clinical Psychiatry. 6 (Suppl 2): 20–3. PMC 487008. PMID 16001097. ^ Koller EA, Doraiswamy PM (July 2002). "Olanzapine-associated diabetes mellitus". Pharmacotherapy. 22 (7): 841–52. doi:10.1592/phco.22.11.841.33629. PMID 12126218. ^ Weston-Green K, Huang XF, Deng C (February 2010). "Sensitivity of the female rat to olanzapine-induced weight gain--far from the clinic?". Schizophrenia Research. 116 (2–3): 299–300. doi:10.1016/j.schres.2009.09.034. PMID 19840894. ^ a b c Brunton LL, Chabner B, Knollmann BC, eds. (2011). Goodman & Gilman's The Pharmacological Basis of Therapeutics (12th ed.). New York: McGraw-Hill. ISBN 978-0-07-162442-8. ^ Weston-Green K, Huang XF, Deng C (2012). Chang AY, ed. "Alterations to melanocortinergic, GABAergic and cannabinoid neurotransmission associated with olanzapine-induced weight gain". PLOS One. 7 (3): e33548. Bibcode:2012PLoSO...733548W. doi:10.1371/journal.pone.0033548. PMC 3306411. PMID 22438946. ^ Koller EA, Cross JT, Doraiswamy PM, Malozowski SN (September 2003). "Pancreatitis associated with atypical antipsychotics: from the Food and Drug Administration's MedWatch surveillance system and published reports". Pharmacotherapy. 23 (9): 1123–30. doi:10.1592/phco.23.10.1123.32759. PMID 14524644. ^ Weinmann S, Read J, Aderhold V (August 2009). "Influence of antipsychotics on mortality in schizophrenia: systematic review". Schizophrenia Research. 113 (1): 1–11. doi:10.1016/j.schres.2009.05.018. PMID 19524406. ^ Joukamaa M, Heliövaara M, Knekt P, Aromaa A, Raitasalo R, Lehtinen V (February 2006). "Schizophrenia, neuroleptic medication and mortality". The British Journal of Psychiatry. 188 (2): 122–7. doi:10.1192/bjp.188.2.122. PMID 16449697. ^ American Geriatrics Society 2012 Beers Criteria Update Expert Panel (April 2012). "American Geriatrics Society updated Beers Criteria for potentially inappropriate medication use in older adults". Journal of the American Geriatrics Society. 60 (4): 616–31. doi:10.1111/j.1532-5415.2012.03923.x. PMC 3571677. PMID 22376048. ^ Medford N, Sierra M, Baker D, David A (2005). "Understanding and treating depersonalisation disorder". Advances in Psychiatric Treatment. 11 (2): 92–100. doi:10.1192/apt.11.2.92. Archived from the original on 16 July 2011. ^ Patrick V, Levin E, Schleifer S (July 2005). "Antipsychotic polypharmacy: is there evidence for its use?". Journal of Psychiatric Practice. 11 (4): 248–57. doi:10.1097/00131746-200507000-00005. PMID 16041235. ^ Ito H, Koyama A, Higuchi T (September 2005). "Polypharmacy and excessive dosing: psychiatrists' perceptions of antipsychotic drug prescription". The British Journal of Psychiatry. 187 (3): 243–7. doi:10.1192/bjp.187.3.243. PMID 16135861. ^ Vita A, De Peri L, Deste G, Sacchetti E (November 2012). "Progressive loss of cortical gray matter in schizophrenia: a meta-analysis and meta-regression of longitudinal MRI studies". Translational Psychiatry. 2 (11): e190. doi:10.1038/tp.2012.116. PMC 3565772. PMID 23168990. ^ Radua J, Borgwardt S, Crescini A, Mataix-Cols D, Meyer-Lindenberg A, McGuire PK, Fusar-Poli P (November 2012). "Multimodal meta-analysis of structural and functional brain changes in first episode psychosis and the effects of antipsychotic medication". Neuroscience and Biobehavioral Reviews. 36 (10): 2325–33. doi:10.1016/j.neubiorev.2012.07.012. PMID 22910680. ^ Hirose S (2003). "The causes of underdiagnosing akathisia" (PDF). Schizophrenia Bulletin. 29 (3): 547–58. doi:10.1093/oxfordjournals.schbul.a007027. PMID 14609248. Archived (PDF) from the original on 15 October 2015. ^ Dilsaver SC, Alessi NE (March 1988). "Antipsychotic withdrawal symptoms: phenomenology and pathophysiology". Acta Psychiatrica Scandinavica. 77 (3): 241–6. doi:10.1111/j.1600-0447.1988.tb05116.x. PMID 2899377. ^ Glazer WM (2000). "Expected incidence of tardive dyskinesia associated with atypical antipsychotics". The Journal of Clinical Psychiatry. 61 Suppl 4: 21–6. PMID 10739327. ^ Lambert TJ (2007). "Switching antipsychotic therapy: what to expect and clinical strategies for improving therapeutic outcomes". The Journal of Clinical Psychiatry. 68 Suppl 6: 10–3. PMID 17650054. ^ BMJ Group (March 2009). "4.2.1". British National Formulary (57 ed.). United Kingdom: Royal Pharmaceutical Society of Great Britain. p. 192. Withdrawal of antipsychotic drugs after long-term therapy should always be gradual and closely monitored to avoid the risk of acute withdrawal syndromes or rapid relapse. ^ "Atypical Antipsychotics: Mechanism of Action" (PDF). FOCUS: The Journal of Lifelong Learning in Psychiatry. 2 (1): 48–58. January 2004. Archived from the original (PDF) on 2014-02-22. ^ a b Onrust SV, McClellan K (2001). "Perospirone". CNS Drugs. 15 (4): 329–37, discussion 338. doi:10.2165/00023210-200115040-00006. PMID 11463136. ^ Nemeroff CB, Lieberman JA, Weiden PJ, Harvey PD, Newcomer JW, Schatzberg AF, Kilts CD, Daniel DG (November 2005). "From clinical research to clinical practice: a 4-year review of ziprasidone". CNS Spectrums. 10 (11 Suppl 17): 1–20. doi:10.1017/S1092852900019842. PMID 16381088. ^ Swainston Harrison T, Perry CM (2004). "Aripiprazole: a review of its use in schizophrenia and schizoaffective disorder". Drugs. 64 (15): 1715–36. doi:10.2165/00003495-200464150-00010. PMID 15257633. Archived from the original on 2012-07-10. ^ Pickar D, Litman RE, Konicki PE, Wolkowitz OM, Breier A (1990). "Neurochemical and neural mechanisms of positive and negative symptoms in schizophrenia". Modern Problems of Pharmacopsychiatry. 24: 124–51. doi:10.1159/000418015. ISBN 978-3-8055-5050-5. PMID 1970851. ^ Liemburg EJ, Knegtering H, Klein HC, Kortekaas R, Aleman A (June 2012). "Antipsychotic medication and prefrontal cortex activation: a review of neuroimaging findings". European Neuropsychopharmacology. 22 (6): 387–400. doi:10.1016/j.euroneuro.2011.12.008. PMID 22300864. ^ a b McDonald C, Murphy KC (March 2003). "The new genetics of schizophrenia". The Psychiatric Clinics of North America. 26 (1): 41–63. doi:10.1016/S0193-953X(02)00030-8. PMID 12683259. ^ Schmidt CJ, Sorensen SM, Kehne JH, Carr AA, Palfreyman MG (1995). "The role of 5-HT2A receptors in antipsychotic activity". Life Sciences. 56 (25): 2209–22. doi:10.1016/0024-3205(95)00210-W. PMID 7791509. ^ a b Stahl, SM (2003). "Describing an Atypical Antipsychotic: Receptor Binding and Its Role in Pathophysiology" (PDF). Prim Care Companion J Clin Psychiatry. 5 (Suppl. 3): 9–13. Archived (PDF) from the original on 16 October 2013. ^ Gross G, Geyer MA (2012). Current Antipsychotics. Springer. pp. 88–89. doi:10.1007/978-3-642-25761-2. ISBN 978-3-642-25761-2. ^ a b c d e f g h i j k l m n o p q r s t u v w x y z aa ab ac ad ae af ag ah ai aj ak al am an ao ap aq ar as at Sanchez M (May 2012). Farmacología y endocrinología del comportamiento. Editorial UOC. pp. 148–149. ISBN 978-84-9788-424-2. Archived from the original on 25 November 2017. ^ Fischer J, Ganellin CR (13 December 2006). Analogue-based Drug Discovery. John Wiley & Sons. pp. 305–. ISBN 978-3-527-60749-5. ^ a b c Lidow MS (22 June 2000). Neurotransmitter Receptors in Actions of Antipsychotic Medications. CRC Press. pp. 23–. ISBN 978-1-4200-4177-4. ^ a b c d e f g h i j k l m n o p q r s t u v w x y Silvestre JS, Prous J (June 2005). "Research on adverse drug events. I. Muscarinic M3 receptor binding affinity could predict the risk of antipsychotics to induce type 2 diabetes". Methods and Findings in Experimental and Clinical Pharmacology. 27 (5): 289–304. doi:10.1358/mf.2005.27.5.908643. PMID 16082416. ^ "Aripiprazole lauroxil - Alkermes - AdisInsight". ^ "Blonanserin - Sumitomo Dainippon Pharma - AdisInsight". ^ "Brexpiprazole - Lundbeck/Otsuka - AdisInsight". Archived from the original on 11 October 2016. Retrieved 27 September 2017. ^ "Cariprazine - Gedeon Richter - AdisInsight". Archived from the original on 18 August 2017. Retrieved 7 May 2017. ^ a b Csernansky JG (6 December 2012). Antipsychotics. Springer Science & Business Media. pp. 360–. ISBN 978-3-642-61007-3. ^ William Andrew Publishing (22 October 2013). Pharmaceutical Manufacturing Encyclopedia. Elsevier. pp. 1077–. ISBN 978-0-8155-1856-3. ^ a b William Andrew Publishing (22 October 2013). Pharmaceutical Manufacturing Encyclopedia. Elsevier. pp. 1102–. ISBN 978-0-8155-1856-3. ^ Protiva, M. (2010). "ChemInform Abstract: Fifty Years in Chemical Drug Research". ChemInform. 23 (9): no. doi:10.1002/chin.199209338. ISSN 0931-7597. ^ Melich H (April 1971). "[Clotepin]". Casopis Lekaru Ceskych (in Czech). 110 (17): 404–5. PMID 5576292. ^ a b Drugs Available Abroad. Gale Research. 1991. p. 52,169. ISBN 978-0-8103-7177-4. Archived from the original on 22 July 2017. ^ Geller V, Gorzaltsan I, Shleifer T, Belmaker RH, Bersudsky Y (December 2005). "Clotiapine compared with chlorpromazine in chronic schizophrenia". Schizophrenia Research. 80 (2–3): 343–7. doi:10.1016/j.schres.2005.07.007. PMID 16126373. ^ Bourin M, Dailly E, Hascöet M (2004). "Preclinical and clinical pharmacology of cyamemazine: anxiolytic effects and prevention of alcohol and benzodiazepine withdrawal syndrome". CNS Drug Reviews. 10 (3): 219–29. doi:10.1111/j.1527-3458.2004.tb00023.x. PMID 15492772. ^ Lamberth C, Dinges J (16 August 2012). Bioactive Heterocyclic Compound Classes: Pharmaceuticals. John Wiley & Sons. pp. 3–. ISBN 978-3-527-66447-4. ^ a b Pedersen V (1996). "Thioxanthene antipsychotics". European Psychiatry. 11: 236s. doi:10.1016/0924-9338(96)88706-2. ISSN 0924-9338. ^ "Iloperidone - Vanda Pharmaceuticals - AdisInsight". Archived from the original on 11 December 2015. Retrieved 27 September 2017. ^ a b Shorter E (2009). Before Prozac: The Troubled History of Mood Disorders in Psychiatry. Oxford University Press, USA. pp. 14–. ISBN 978-0-19-536874-1. ^ Glazer WM (1999). "Does loxapine have "atypical" properties? Clinical evidence". The Journal of Clinical Psychiatry. 60 Suppl 10: 42–6. PMID 10340686. ^ "Lurasidone - Sumitomo Dainippon Pharma - AdisInsight". Archived from the original on 10 May 2016. Retrieved 7 May 2017. ^ "Paliperidone - Johnson & Johnson - AdisInsight". ^ "Paliperidone palmitate - Johnson & Johnson - AdisInsight". Archived from the original on 30 October 2016. Retrieved 27 September 2017. ^ a b Vardanyan R (12 June 2017). Piperidine-Based Drug Discovery. Elsevier Science. pp. 158, 195–. ISBN 978-0-12-813428-3. ^ Roelofs GA (1974). "Penfluridol (R 16341) as a maintenance therapy in chronic psychotic patients: a double-blind clinical evaluation". Acta Psychiatrica Scandinavica. 50 (2): 219–24. doi:10.1111/j.1600-0447.1974.tb08210.x. PMID 4604881. ^ Leucht S, Helfer B, Hartung B (Jan 2014). "Perazine for schizophrenia". The Cochrane Database of Systematic Reviews (1): CD002832. doi:10.1002/14651858.CD002832.pub3. PMID 24425538. ^ Matar HE, Almerie MQ, Makhoul S, Xia J, Humphreys P (May 2014). "Pericyazine for schizophrenia". The Cochrane Database of Systematic Reviews (5): CD007479. doi:10.1002/14651858.CD007479.pub2. PMID 24825770. ^ "Pimavanserin - ACADIA Pharmaceuticals - AdisInsight". Archived from the original on 25 September 2017. Retrieved 27 September 2017. ^ William Andrew Publishing (22 October 2013). Pharmaceutical Manufacturing Encyclopedia. Elsevier. pp. 2935–. ISBN 978-0-8155-1856-3. ^ William Andrew Publishing (2007). Pharmaceutical Manufacturing Encyclopedia. William Andrew Pub. p. 3059. ISBN 978-0-8155-1526-5. ^ William Andrew Publishing (22 October 2013). Pharmaceutical Manufacturing Encyclopedia. Elsevier. pp. 3129–. ISBN 978-0-8155-1856-3. ^ William Andrew Publishing (22 October 2013). Pharmaceutical Manufacturing Encyclopedia. Elsevier. pp. 3214–. ISBN 978-0-8155-1856-3. ^ Isbister GK, Balit CR, Macleod D, Duffull SB (August 2010). "Amisulpride overdose is frequently associated with QT prolongation and torsades de pointes". Journal of Clinical Psychopharmacology. 30 (4): 391–5. doi:10.1097/JCP.0b013e3181e5c14c. PMID 20531221. ^ a b c Deeks ED, Keating GM (January 2010). "Blonanserin: a review of its use in the management of schizophrenia". CNS Drugs. 24 (1): 65–84. doi:10.2165/11202620-000000000-00000. PMID 20030420. ^ a b Tenjin T, Miyamoto S, Ninomiya Y, Kitajima R, Ogino S, Miyake N, Yamaguchi N (2013). "Profile of blonanserin for the treatment of schizophrenia". Neuropsychiatric Disease and Treatment. 9: 587–94. doi:10.2147/NDT.S34433. PMC 3677929. PMID 23766647. ^ "Clozapine". Martindale: The Complete Drug Reference. Royal Pharmaceutical Society of Great Britain. 30 January 2013. Retrieved 2 November 2013. ^ Chakrabarti A, Bagnall A, Chue P, Fenton M, Palaniswamy V, Wong W, Xia J (October 2007). Chakrabarti A, ed. "Loxapine for schizophrenia". The Cochrane Database of Systematic Reviews (4): CD001943. doi:10.1002/14651858.CD001943.pub2. PMID 17943763. ^ Harvey PD, Ogasa M, Cucchiaro J, Loebel A, Keefe RS (April 2011). "Performance and interview-based assessments of cognitive change in a randomized, double-blind comparison of lurasidone vs. ziprasidone". Schizophrenia Research. 127 (1–3): 188–94. doi:10.1016/j.schres.2011.01.004. PMID 21277745. ^ Röhricht F, Gadhia S, Alam R, Willis M (2012). "Auditing clinical outcomes after introducing off-licence prescribing of atypical antipsychotic melperone for patients with treatment refractory schizophrenia". TheScientificWorldJournal. 2012: 1–5. doi:10.1100/2012/512047. PMC 3330679. PMID 22566771. ^ a b Molindone Hydrochloride. Martindale: The Complete Drug Reference. The Royal Pharmaceutical Society of Great Britain. 30 January 2013. Retrieved 5 November 2013. ^ Leucht S, Helfer B, Hartung B (January 2014). "Perazine for schizophrenia". The Cochrane Database of Systematic Reviews (1): CD002832. doi:10.1002/14651858.CD002832.pub3. PMID 24425538. ^ Onrust SV, McClellan K (April 2001). "Perospirone". CNS Drugs. 15 (4): 329–37, discussion 338. doi:10.2165/00023210-200115040-00006. PMID 11463136. ^ a b Brayfield A, ed. (23 September 2011). Perospirone. Martindale: The Complete Drug Reference. London, UK: Pharmaceutical Press. Retrieved 3 November 2013. ^ Hartung B, Sampson S, Leucht S (March 2015). "Perphenazine for schizophrenia". The Cochrane Database of Systematic Reviews (3): CD003443. doi:10.1002/14651858.CD003443.pub3. PMID 25749632. ^ Mothi M, Sampson S (November 2013). "Pimozide for schizophrenia or related psychoses". The Cochrane Database of Systematic Reviews (11): CD001949. doi:10.1002/14651858.CD001949.pub3. PMID 24194433. ^ Wang J, Sampson S (April 2014). "Sulpiride versus placebo for schizophrenia". The Cochrane Database of Systematic Reviews (4): CD007811. doi:10.1002/14651858.CD007811.pub2. PMID 24729184. ^ Fenton M, Rathbone J, Reilly J, Sultana A (July 2007). Reilly J, ed. "Thioridazine for schizophrenia". The Cochrane Database of Systematic Reviews (3): CD001944. doi:10.1002/14651858.CD001944.pub2. PMID 17636691. ^ Fornaro P, Calabria G, Corallo G, Picotti GB (July 2002). "Pathogenesis of degenerative retinopathies induced by thioridazine and other antipsychotics: a dopamine hypothesis". Documenta Ophthalmologica. Advances in Ophthalmology. 105 (1): 41–9. doi:10.1023/A:1015768114192. PMID 12152801. ^ Marques LO, Lima MS, Soares BG (2004). Marques Ld, ed. "Trifluoperazine for schizophrenia". The Cochrane Database of Systematic Reviews (1): CD003545. doi:10.1002/14651858.CD003545.pub2. PMID 14974020. ^ "Zotepine". Martindale: The Complete Drug Reference. Royal Pharmaceutical Society of Great Britain. 16 August 2013. Retrieved 2 November 2013. ^ Cipriani A, Barbui C, Salanti G, Rendell J, Brown R, Stockton S, Purgato M, Spineli LM, Goodwin GM, Geddes JR (October 2011). "Comparative efficacy and acceptability of antimanic drugs in acute mania: a multiple-treatments meta-analysis". Lancet. 378 (9799): 1306–15. doi:10.1016/S0140-6736(11)60873-8. PMID 21851976. ^ Citrome L (2013). "Addressing the need for rapid treatment of agitation in schizophrenia and bipolar disorder: focus on inhaled loxapine as an alternative to injectable agents". Therapeutics and Clinical Risk Management. 9: 235–45. doi:10.2147/TCRM.S31484. PMC 3665578. PMID 23723707. ^ Cruz N, Sanchez-Moreno J, Torres F, Goikolea JM, Valentí M, Vieta E (February 2010). "Efficacy of modern antipsychotics in placebo-controlled trials in bipolar depression: a meta-analysis". The International Journal of Neuropsychopharmacology. 13 (1): 5–14. doi:10.1017/S1461145709990344. hdl:2445/53243. PMID 19638254. ^ Popovic D, Reinares M, Goikolea JM, Bonnin CM, Gonzalez-Pinto A, Vieta E (May 2012). "Polarity index of pharmacological agents used for maintenance treatment of bipolar disorder". European Neuropsychopharmacology. 22 (5): 339–46. doi:10.1016/j.euroneuro.2011.09.008. PMID 22000157. ^ Vieta E, Günther O, Locklear J, Ekman M, Miltenburger C, Chatterton ML, Åström M, Paulsson B (September 2011). "Effectiveness of psychotropic medications in the maintenance phase of bipolar disorder: a meta-analysis of randomized controlled trials" (PDF). The International Journal of Neuropsychopharmacology. 14 (8): 1029–49. doi:10.1017/S1461145711000885. hdl:2445/51726. PMID 21733231. Archived (PDF) from the original on 18 August 2017. ^ Komossa K, Depping AM, Gaudchau A, Kissling W, Leucht S (December 2010). "Second-generation antipsychotics for major depressive disorder and dysthymia". The Cochrane Database of Systematic Reviews (12): CD008121. doi:10.1002/14651858.CD008121.pub2. PMID 21154393. ^ Kishi T, Iwata N (September 2013). "Efficacy and tolerability of perospirone in schizophrenia: a systematic review and meta-analysis of randomized controlled trials". CNS Drugs. 27 (9): 731–41. doi:10.1007/s40263-013-0085-7. PMID 23812802. ^ Roth BL, Driscol J (12 January 2011). "PDSP Ki Database". Psychoactive Drug Screening Program (PDSP). University of North Carolina at Chapel Hill and the United States National Institute of Mental Health. Archived from the original on 8 November 2013. Retrieved 11 November 2013. ^ Shahid M, Walker GB, Zorn SH, Wong EH (January 2009). "Asenapine: a novel psychopharmacologic agent with a unique human receptor signature". Journal of Psychopharmacology. 23 (1): 65–73. doi:10.1177/0269881107082944. PMID 18308814. ^ a b Ishiyama T, Tokuda K, Ishibashi T, Ito A, Toma S, Ohno Y (October 2007). "Lurasidone (SM-13496), a novel atypical antipsychotic drug, reverses MK-801-induced impairment of learning and memory in the rat passive-avoidance test". European Journal of Pharmacology. 572 (2–3): 160–70. doi:10.1016/j.ejphar.2007.06.058. PMID 17662268. ^ Ishibashi T, Horisawa T, Tokuda K, Ishiyama T, Ogasa M, Tagashira R, Matsumoto K, Nishikawa H, Ueda Y, Toma S, Oki H, Tanno N, Saji I, Ito A, Ohno Y, Nakamura M (July 2010). "Pharmacological profile of lurasidone, a novel antipsychotic agent with potent 5-hydroxytryptamine 7 (5-HT7) and 5-HT1A receptor activity". The Journal of Pharmacology and Experimental Therapeutics. 334 (1): 171–81. doi:10.1124/jpet.110.167346. PMID 20404009. ^ López-Muñoz F, Alamo C (September 2013). "Active metabolites as antidepressant drugs: the role of norquetiapine in the mechanism of action of quetiapine in the treatment of mood disorders". Frontiers in Psychiatry. 4: 102. doi:10.3389/fpsyt.2013.00102. PMC 3770982. PMID 24062697. ^ "Medscape home page". Medscape. WebMD. Archived from the original on 13 November 2013. ^ "Therapeutic Goods Administration home page". Therapeutic Goods Administration. Department of Health (Australia). Archived from the original on 21 April 2013. ^ "Daily Med home page". Daily Med. United States National Library of Medicine. Archived from the original on 18 June 2013. ^ "electronic Medicines Compendium (eMC) home page". electronic Medicines Compendium. Datapharm. Archived from the original on 27 November 2013. ^ Wen YG, Shang DW, Xie HZ, Wang XP, Ni XJ, Zhang M, Lu W, Qiu C, Liu X, Li FF, Li X, Luo FT (March 2013). "Population pharmacokinetics of blonanserin in Chinese healthy volunteers and the effect of the food intake". Human Psychopharmacology. 28 (2): 134–41. doi:10.1002/hup.2290. PMID 23417765. ^ Borgström L, Larsson H, Molander L (1982). "Pharmacokinetics of parenteral and oral melperone in man". European Journal of Clinical Pharmacology. 23 (2): 173–6. doi:10.1007/BF00545974. PMID 7140807. ^ Callaghan JT, Bergstrom RF, Ptak LR, Beasley CM (September 1999). "Olanzapine. Pharmacokinetic and pharmacodynamic profile". Clinical Pharmacokinetics. 37 (3): 177–93. doi:10.2165/00003088-199937030-00001. PMID 10511917. ^ Vermeir M, Naessens I, Remmerie B, Mannens G, Hendrickx J, Sterkens P, Talluri K, Boom S, Eerdekens M, van Osselaer N, Cleton A (April 2008). "Absorption, metabolism, and excretion of paliperidone, a new monoaminergic antagonist, in humans". Drug Metabolism and Disposition. 36 (4): 769–79. doi:10.1124/dmd.107.018275. PMID 18227146. ^ DeVane CL, Nemeroff CB (2001). "Clinical pharmacokinetics of quetiapine: an atypical antipsychotic". Clinical Pharmacokinetics. 40 (7): 509–22. doi:10.2165/00003088-200140070-00003. PMID 11510628. ^ Wiesel FA, Alfredsson G, Ehrnebo M, Sedvall G (May 1980). "The pharmacokinetics of intravenous and oral sulpiride in healthy human subjects". European Journal of Clinical Pharmacology. 17 (5): 385–91. doi:10.1007/BF00558453. PMID 7418717. ^ Prakash A, Lamb HM (January 1998). "Zotepine: A Review of its Pharmacodynamic and Pharmacokinetic Properties and Therapeutic Efficacy in the Management of Schizophrenia". CNS Drugs. 9 (2): 153–175. doi:10.2165/00023210-199809020-00006. ^ Product Information: Nipolept(R), zotepine. Klinge Pharma GmbH, Munich, 1996. 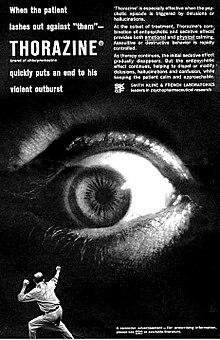 ^ The text reads: "When the patient lashes out against 'them' - THORAZINE (brand of chlorpromazine) quickly puts an end to his violent outburst. 'Thorazine' is especially effective when the psychotic episode is triggered by delusions or hallucinations. At the outset of treatment, Thorazine's combination of antipsychotic and sedative effects provides both emotional and physical calming. Assaultive or destructive behavior is rapidly controlled. As therapy continues, the initial sedative effect gradually disappears. But the antipsychotic effect continues, helping to dispel or modify delusions, hallucinations and confusion, while keeping the patient calm and approachable. SMITH KLINE AND FRENCH LABORATORIES leaders in psychopharmaceutical research." ^ a b Pieters T, Majerus B (December 2011). "The introduction of chlorpromazine in Belgium and the Netherlands (1951-1968); tango between old and new treatment features". Studies in History and Philosophy of Biological and Biomedical Sciences. 42 (4): 443–52. doi:10.1016/j.shpsc.2011.05.003. PMID 22035718. Archived from the original on 9 July 2017. ^ Healy, D. 2005. Psychiatric Drugs Explained. 4th Ed. Britain:Elsevier Limited. P. 8, 17. ^ a b c d e f King C, Voruganti LN (May 2002). "What's in a name? The evolution of the nomenclature of antipsychotic drugs". Journal of Psychiatry & Neuroscience. 27 (3): 168–75. PMC 161646. PMID 12066446. ^ "tranquillizer, n". Oxford English Dictionary. 1989. Retrieved 2011-08-09. ^ Healy D (2008). "The intersection of psychopharmacology and psychiatry in the second half of the twentieth century". In Wallace, Edwin R., Gach, John. History of Psychiatry and Medical Psychology. Boston, MA: Springer US. p. 421. ISBN 978-0-387-34707-3. Retrieved 9 August 2011. ^ Owens DG (13 April 1999). A guide to the extrapyramidal side-effects of antipsychotic drugs. Cambridge University Press. p. 12. ISBN 978-0-521-63353-6. Archived from the original on 18 March 2016. ^ Tasman A (1997). Psychiatry Volume 2. Saunders. p. 956. ISBN 978-0-7216-5257-3. ^ Ayd, Frank J. (2000). "neuroleptic". Lexicon of Psychiatry, Neurology, and the Neurosciences. Lippincott Williams & Wilkins. p. 675. ISBN 9780781724685. ^ R. Elliott Ingersoll, Carl F. Rak (2015): Psychopharmacology for Mental Health Professionals: An Integrative Approach, Cengage Learning, Boston, pp. 150-186 and 342-349, ISBN 9781305537231. ^ Patel SC, Jakopac KA (2011). Manual of Psychiatric Nursing Skills. Jones & Bartlett Publishers. p. 317. ISBN 9781449613563. Archived from the original on 27 October 2017. ^ Drug Policy and the Public Good. OUP Oxford. 2010. p. 329. ISBN 9780199557127. Archived from the original on 28 October 2017. ^ a b Pipelineantipsychotic drugs to drive next market evolution (2009). Healthcarefinancenews.com (7 August 2009). ^ Aparasu RR, Bhatara V (December 2006). "Antipsychotic use and expenditure in the United States". Psychiatric Services. 57 (12): 1693. doi:10.1176/appi.ps.57.12.1693. PMID 17158480. ^ 2008 U.S. Sales and Prescription Information: Top Therapeutic Classes by U.S. Sales (PDF) Archived 16 April 2010 at the Wayback Machine. Imshealth.com. ^ James, Adam (2 March 2008). "Myth of the antipsychotic". The Guardian. Guardian News and Media Limited. Archived from the original on 8 January 2014. Retrieved 27 July 2012. ^ Nick Triggle (12 November 2009). "Dementia drug use 'killing many'". BBC. Archived from the original on 26 April 2013. Retrieved 7 May 2013. ^ "UK study warns against antipsychotics for dementia". reuters. 12 November 2009. Archived from the original on 20 July 2014. Retrieved 7 May 2013. ^ Hilzenrath, David S. (16 January 2010). "Justice suit accuses Johnson & Johnson of paying kickbacks". The Washington Post. Archived from the original on 10 November 2012. Retrieved 17 January 2010. ^ a b c Wilson, Duff (2 October 2010). "Side Effects May Include Lawsuits". New York Times. Archived from the original on 23 June 2017. ^ DUFF WILSON (27 February 2009). "Drug Maker's E-Mail Released in Seroquel Lawsuit". The New York Times. The New York Times Company. Archived from the original on 3 May 2011. Retrieved 27 July 2012. ^ Gosden R, Beder S (2001). "Pharmaceutical industry agenda setting in mental health policies". Ethical Human Sciences and Services. 3 (3): 147–59. PMID 15278977. Archived from the original on 30 April 2010. Association, American Psychiatric (2006). "Practice Guideline for the Treatment of Patients with Alzheimer's Disease and Other Dementias, Second Edition". APA Practice Guidelines for the Treatment of Psychiatric Disorders: Comprehensive Guidelines and Guideline Watches. 1. doi:10.1176/appi.books.9780890423967.152139. ISBN 978-0-89042-336-3. Aparasu RR, Bhatara V (December 2006). "Antipsychotic use and expenditure in the United States". Psychiatric Services. 57 (12): 1693. doi:10.1176/appi.ps.57.12.1693. PMID 17158480. Gitlin LN, Kales HC, Lyketsos CG (November 2012). "Nonpharmacologic management of behavioral symptoms in dementia". JAMA. 308 (19): 2020–9. doi:10.1001/jama.2012.36918. PMC 3711645. PMID 23168825. Maglione, M.; Maher, A. R.; Hu, J.; Wang, Z.; Shanman, R.; Shekelle, P. G.; Roth, B.; Hilton, L.; Suttorp, M. J.; Ewing, B. A.; Motala, A.; Perry, T. (Sep 2011). "Off-Label Use of Atypical Antipsychotics: An Update". PMID 22132426. Richter T, Meyer G, Möhler R, Köpke S (December 2012). "Psychosocial interventions for reducing antipsychotic medication in care home residents". The Cochrane Database of Systematic Reviews. 12: CD008634. doi:10.1002/14651858.cd008634.pub2. PMID 23235663. American Geriatrics Society 2012 Beers Criteria Update Expert Panel (April 2012). "American Geriatrics Society updated Beers Criteria for potentially inappropriate medication use in older adults". Journal of the American Geriatrics Society. 60 (4): 616–31. doi:10.1111/j.1532-5415.2012.03923.x. PMC 3571677. PMID 22376048. Maher AR, Maglione M, Bagley S, Suttorp M, Hu JH, Ewing B, Wang Z, Timmer M, Sultzer D, Shekelle PG (September 2011). "Efficacy and comparative effectiveness of atypical antipsychotic medications for off-label uses in adults: a systematic review and meta-analysis". JAMA. 306 (12): 1359–69. doi:10.1001/jama.2011.1360. PMID 21954480. Schneider LS, Tariot PN, Dagerman KS, Davis SM, Hsiao JK, Ismail MS, Lebowitz BD, Lyketsos CG, Ryan JM, Stroup TS, Sultzer DL, Weintraub D, Lieberman JA (October 2006). "Effectiveness of atypical antipsychotic drugs in patients with Alzheimer's disease". The New England Journal of Medicine. 355 (15): 1525–38. doi:10.1056/nejmoa061240. PMID 17035647. Wikimedia Commons has media related to Antipsychotic drugs. Fallon, P.; Dursun, S.; Deakin, B. (2012). "Drug-induced supersensitivity psychosis revisited: Characteristics of relapse in treatment-compliant patients". Therapeutic Advances in Psychopharmacology. 2 (1): 13–22. doi:10.1177/2045125311431105. PMC 3736929. PMID 23983951.